Clean sheet night is probably my favorite night of the week. I can get into my clean, made, bed and forget all about the basket of clothes in the floor beside me. I don’t have to think about the dirty dishes on my side stand, or the empty granola bar wrapper/wrappers that was left by one or both of the kids. I can take my glasses off and it’s all a blur, I can just pretend like it’s not even there. When I crawl under the blanket and slide my legs into the clean sheets, it feels something like what perfection must feel like. Ahhh. Last night was clean sheet night. I took a shower and shaved my legs. (One of the things that make having clean sheets even better.) I could hardly wait to go to bed. It had been a pretty productive day. I had cleaned the living room, mopped the kitchen floor and made a decently healthy supper. I cooked garlicky chicken and quinoa. The kids were both fed and had brushed their teeth, and Harper was bathed and in her pajamas. It was still early, so I left the kids with Brad so I could sneak away to my slumber. I lay down, settled in and turned off the light on the side table. It was so nice. Then, not 45 seconds later, I heard Harper running down the hall. She crawled up in the bed with her giant stuffed pup and got under the covers with me. I smelled something. It was food. It was the garlicky chicken that I had made for supper. Then I felt it. It was the quinoa falling out of her hair all over my clean sheets! I do not know how, but the child had about two tablespoons of quinoa stuck all in the side of her hair. As she snuggled closer under the covers, the quinoa was squishing into my sheets and rolling down the bed to where I lay. We got up, wiped the quinoa off the sheets and combed it out of her hair, and went back to bed. It wasn’t perfect, but it was perfection for me. My precious little girl wanted to snuggle up with her mommy, and how could I deny her that. I love those little snuggles. As a mommy of two littles, I can’t expect things to go just so. Things haven’t gone “just so” in well over 9 years. I have had to lower my standards immensely from what they were before children. When I say lower my standards, what I mean is that I no longer have standards. But that is okay. It has made me a better person. I think. Has it? I don’t know. I have also lost most of my thinking ability. What I do know is that it’s been a busy day today. Clean sheet day has come and gone, there are blankets, toys and shoes strewn all across my living room, there is mud on the kitchen floor, and the kids are eating canned soup for dinner. Wesley’s summer has been very eventful so far. It seems like it is going by so fast. Too fast. In one month, he will start kindergarten. That makes his Mamma’s heart break. We have tried to stay busy and have fun before school starts. I bought us season tickets to the water park and we have been going once or twice a week. We have traveled to Indiana to see our cousins, then to Cincinnati for a NephCure walk, then to Johnson City, Tennessee for our convention. All back to back. It feels good to finally be home and not traveling. My most fond memories are of summers when my cousins would come visit. We would have the best times playing all day, then staying up late catching lightning bugs and looking at the stars. Then we would go to bed, wake up and do it all over again. I want that for Wesley too. He has lots of cousins and he loves them all. We have gotten together with them a few times this year. It seems the same as it was for me when I was little. Even though they only see one another occasionally, they are best buds when they get together. It’s like they were never apart. This summer, with cousins (and friends as close as cousins) we have picked strawberries, went to the fair, swam, hiked, learned to shoot a bow, dug in the dirt, gone to the drive-in, caught lightning bugs, cooked out, roasted marshmallows and got a few boo-boos. 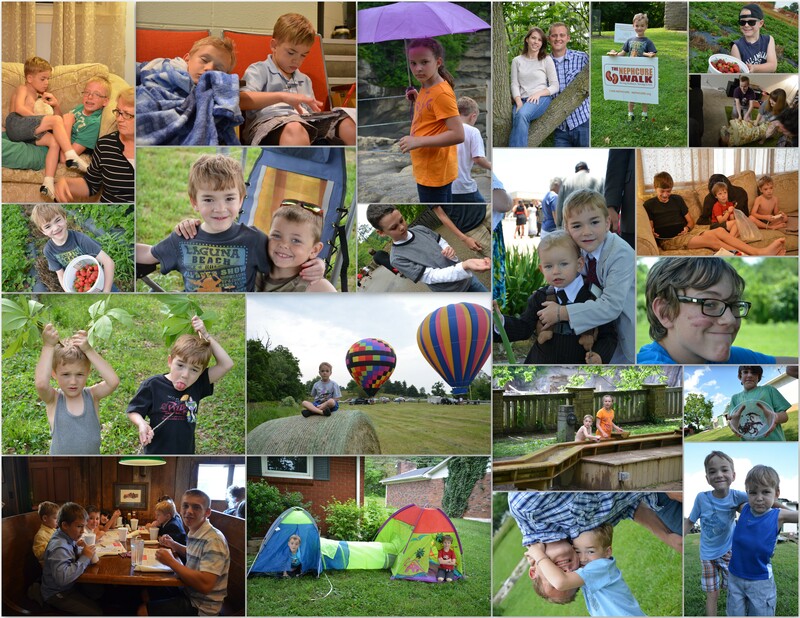 I would call that a good summer for a five year old boy. The best news is that Wesley has been in remission for ten months! It really eases the worries. It’s not over yet. We still have time for more fun. As a Mommy, this has been my best summer yet! Last night we found our cats running down the hall batting a dead mouse back and forth. Gross! Well, thankfully it was dead. I was happy to know that my cats know how to take care of business… and hopeful that there were no more of those cute little critters running around my house. We came home tonight and Wes was eating a snack while I read him a story. I heard a rustle in the egg noodle bag. Yes, it was another mouse. Yes, I threw away everything open on my counter. So, the boy decided to trap this mouse. He came up with a plan fast. 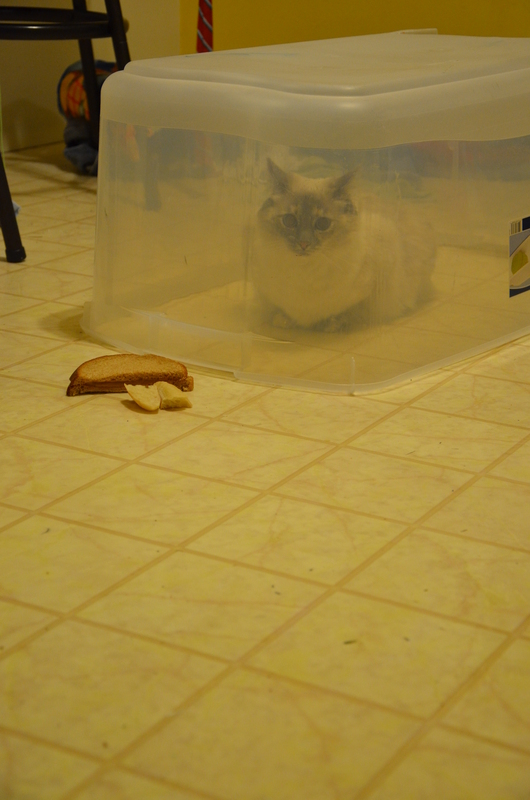 Notice the half peanut butter sandwich to draw the mouse to the trap. I suppose my child will stand here all night until he catches his mouse! Finally, after four very long years, there is a possibility that Wesley may have outgrown some or all of his food allergies. We have been waiting to get all of the immunosuppressants out of his system so that he can be tested. It really and truly has always felt like this day would never come. Last week I called his allergist and made an appointment for Monday. I talked to her later on Friday and she said if we could get blood work done that day, he could do one oral food challenge at his appointment if the allergy “markers” weren’t there. Oh, I was SO excited. I was at work, but I immediately made arrangements to take the kid to get blood work. Come to find out, it has to be sent out of town and we won’t know until Wednesday. So, our appointment will be Wednesday. It is just such a good thing to think about. Wow, we have been so consumed with every bite that our kid eats and even what we eat for so long, it is nice to ponder that maybe, just maybe our kid can eat like everybody else’s kid does. People won’t think we are overreacting. When we go to restaurants we won’t have to ask for the manager and tell him fifteen times that our kid could die if he doesn’t cook the food the way we tell him to. If we eat cereal with real milk, we won’t have to wash our mouth and quarantine everything that touched the milk. In fact, it is very rare that we even own cow’s milk anymore. I have tried several times to completely ban it from the house. We have probably only bought eggs about five times in these last four years because it is so scary to make sure all the egg is cleaned off even before we put it in the dishwasher. We realized that Wesley had a problem very early. In the NICU, he couldn’t nurse so I pumped. They gave him my milk, but continued to push me to add formula so that he would grow faster. I refused for several weeks until they finally made me feel like I was starving my child. (Which I definitely wasn’t.) So, I gave the okay to mix formula in. It made him very sick. He got NEC and was npo for seven days. Then THEY were starving my child. Err, makes me mad to even think about it. So after he came home and continued to grow, we did what a lot of parents do. He was probably six months old and we were eating ice cream. We put a little in his mouth to see if he liked it. Not long after, he had a rash around his mouth. Not a big deal. I never suspected a serious allergy and we moved on with our life. In the next few months he would get a small rash around his mouth occasionally after eating. It concerned me, but not much because the rash was the only symptom. Then, one night we had friends over and ordered pizza. Wesley was just a little over a year old and had a couple of little teeth. I gave him a pizza crust to chew on. About an hour later, his face was crazy swollen. His eyes almost swelled shut. He was wheezing. I was a big dummy. He was having an anaphylactic reaction. I really didn’t think that could happen unless you had a nut allergy. We called the on call pediatrician. It was about 11:00 at night. He told me he was having an allergic reaction, go straight to the emergency room. I still wasn’t even that worried about it. I really didn’t know how serious it was. Well, his breathing kept getting worse and his lips were turning blue by the time we got there. The next week, he was allergy tested and here we are. Once, he drank some of my iced coffee through a straw. It had cream in it. He started reacting and I had to use the EpiPen. Not long after this, he had a cup of milk spilled on him. On his body, everywhere the milk had touched, (which was most of his body) looked like it had been burned. Another ER visit. And that wasn’t even from ingesting it. It was skin contact, and that was the beginning of the Arnett house milk ban. Nevertheless, I have been very diligent to keep my child safe from these foods that could kill him. So, all of these nice thoughts have been going through my head. I keep thinking of all the things that he has never had and how I want him to have them all. I keep imagining what if he has only outgrown one allergen. It would open up a whole new menu for our kid. I am just seriously overjoyed. But then, I think, how can this even be possible. How can something so deadly just be outgrown? Just like that? Apparently it happens. In fact, by the time children are five, and Wesley is, they have a 90% chance of being allergy free. Except for peanuts. Most of the time peanut allergies are for life. Thankfully, Wes isn’t allergic to peanuts. Wesley is pretty dern ecstatic about this allergy test too. After he had rituximab, we started to realize that if he could just stay in remission long enough, he would be able to be tested. I started talking about it to him about a month ago. He talks about it very often. We go to the store and read the ingredients and daydream of what he could eat if only he just outgrew soy. He has been talking about having his allergy test since I told him. I was at work when I found out he needed blood work on Friday. I called the house to tell my mother-in-law to take him to the lab. I talked to Wesley and he normally hates to know he is getting blood work. He was SO happy! But, little did I know that my kid is just as stressed out about this as me, maybe even more so. Last night we were going to sleep and he was talking a lot. Then he kind of got sad and tears were welling up in his eyes. He asked me how did I know that he wouldn’t die when we do the food challenge. I told him his doctor would be very certain that it was safe before we try it. I reminded him how we did the peanut challenge. I told him if he had a reaction, we have medicine and he wouldn’t die. He cried. And I think, this is all he has ever known. He is an awesome self-advocate. I have taught him how serious food allergies are. How scared my baby must to go against every thing he has been taught. Boy does it break my heart that my little boy, who should be carefree, is worrying about such a thing. He has been through so much in his short little five years. He doesn’t even realize it. It is all just normal to him…. Until we tell him he can eat an allergen. Well, that is yet to be seen. We have to get the blood work back first. So this is what I am thinking and why I am still awake at the time that most people are just waking up from their good night’s sleep. Monday, we went to Lexington with Brad’s mom to take the niece and nephew back to their mamma. We met at the mall and shopped some. Wesley started feeling bad about an hour later and said his legs were hurting and he wanted to be carried. Then my mother in law said that Wesley was feeling hot. He was so whiney and hurting. After what seemed like forever, I finally made my way to Walmart to get a thermometer. I wanted to check him while we were there because I knew if it was very high, we could very well end up right back there in the hospital. After he had his rituximab infusions, the doctor said not to mess around with a fever. A fever is an emergency. I took his temperature and it was under 100. We went on home and he went to bed early. Tuesday was New Year’s. The boy was still running a low-grade fever and seemed weak, but no doctors were open and his temperature was still under 101. That night, it got higher so I paged his nephrologist. He said to take him to his pediatrician in the morning. At that point, me and Brad were coming down with it too. We all had fevers and our bodies ached. So Wednesday morning, we were a mess. I knew I had to take the boy to the doctor. I got up, called for an appointment and took a shower. We got there and waited. Wesley was on the table playing a game and I just got up there and laid beside him. No position I was in made me comfortable. The nurse swabbed his throat and his nose. Fifteen minutes later, the doctor walked in with an informational paper and said the flu test was positive. She prescribed him Tamiflu and sent us home to drink plenty of liquids. We all stayed in bed for the rest of the day except I had to go to the pharmacy to get the Tamiflu. That night was rough. We were all so miserable. Every time I coughed, I felt like a cat coughing up a hairball. It was gagging me. I threw up on the wall. Not much is worse than cleaning up your own vomit. I went to my doctor the next day because of my cough. Every time I coughed, even now still, I can’t get control over it. My flu test was positive as well, despite having the flu shot this fall. I could’ve saved a $35 copay and told him that on the phone if he would just call me in something for cough. He prescribed me cough syrup and sent me home to drink plenty of liquids. Fortunately, Wesley is getting better. No relapse. But now that he is better, there is nobody to entertain the poor little guy. He has watched every episode of Phineas and Ferb ever made. Now he is on to Garfield and Pocoyo. He has been in here every 15 minutes happily jumping on the bed causing our heads to throb. Poor kid. The first one to get better always gets the bad end of the deal. Me and Brad are cold and sweaty and feverish. Yesterday Brad said that our sheets must be teeming with all sorts of nasty germs. I washed them. I am sure they need it again, maybe when this goes away. On a positive note, this is the most time we have spent together as a family in a very long time. I am so hoping that the morning will be better. Maybe next week I can write a much more interesting story when I am not under the influence of cough syrup and cold medicine. Until then, stay far away from us. You do not want this! I have an online support group that I use for Wesley’s rare kidney disease. One of my fellow support groupers just shared this wonderful poem. It brought tears to my eyes. It is a wonderful illustration of how I feel about Wesley.